Why do merchants prefer Magento over BigCommerce? eCommerce is the latest fascination in the shopping industry. People shop more on eCommerce websites then they do in say, a mall. This is the reason why more eCommerce websites are cropping up by the day. For a new company, it is difficult to compete with big names like Amazon or Flipkart unless they have a top of the notch website to attract a lot of customers. This is where Magento and BigCommerce and other Content Management Systems like them come in. Magento and BigCommerce are big names when it comes to CMS. 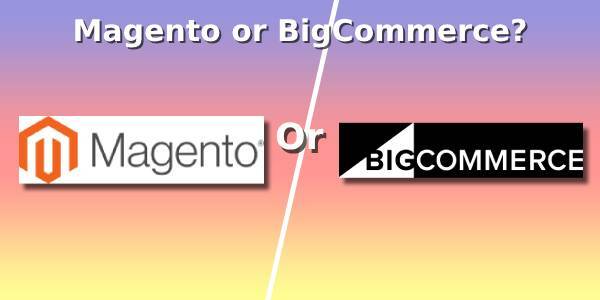 However, merchants prefer Magento over BigCommerce because it has an edge over the latter. Magento eCommerce development is more customizable than BigCommerce’s because Magento users get on-premise software. Let’s compare both these websites. Customization: BigCommerce is a cloud-based CMS where the merchants go online to get their website structure and theme from BigCommerce’s servers and which is later hosted on those servers. Whereas, Magento offers the merchants to download the software on their personal servers so that they can customize it as they need. In Magento, the merchants have the option to customize the website as they want since the website is the first thing, the customer sees. The Merchants have complete access over their website as they host it on their own servers on site. Security: When it comes to BigCommerce, the security of the website and the customers’ details are protected. All the websites hosted on BigCommerce get the same level of security. However, Magento gives the merchants the added benefit of having their own security team in place. The merchants can use high levels of security to protect crucial details. Functionality: While all eCommerce websites need the same basic functionality, the websites which do better which have added functions to make the customers shopping experience easier. Magento lets the merchant do all the customization required to set them apart, according to their need without interfering. All third party customization apps and teams are allowed to make changes to the website’s structure and theme. SEO: It is not enough to put up a website, you need to draw customers towards it. Magento leads in the Search Engine Optimization on a CMS platform. It includes many features such as generating SEO friendly URLs and cross-domain URLs and advanced caching method. All these are part of Magento eCommerce development. Integrating Various Aspects: A website has to work on various aspects such as the accounting aspects, the marketing aspects and the logistics etc. All these aspects are seemingly integrated with the help of Magento. In addition to these features, Magento also provides a higher quality of marketing support to the merchants. It assists merchants with email marketing and makes finding them easier on the platform. The widgets, modules and CMS blocks, make customization of the content much easier and it allows the merchant to wield effective control. A major problem in eCommerce business is customers abandoning the virtual carts. Magento gives the merchant the freedom to inculcate any cart-saver application or any other solution which suits their needs so that they can take advantage of directed email marketing, re-targeting as well as saving abandoned cart. In conclusion, Magento offers much more freedom to customize the websites to suit the targeted audience and set themselves apart from similar websites. It’s maybe a bit difficult to navigate for a newcomer in the eCommerce business but for a middle scale to large-scale business, it gives the perfect solution by which it can retain complete control over the website and its customers.